CRISP, CLEAR, JAW-DROPPING SOUND - And classy looking too!! 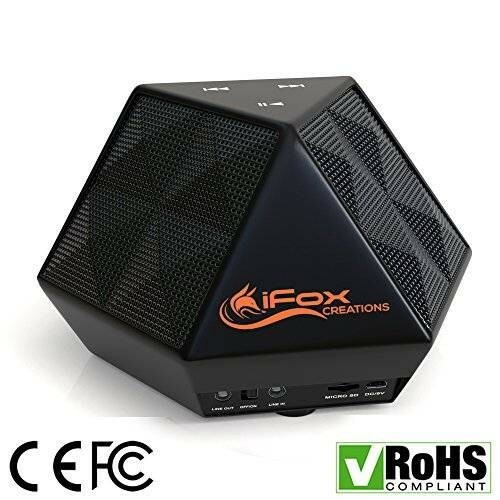 This 6 watt, 2 channel iFox portable mini speaker packs a real punch with amazingly crisp sound even when the volume is up full. Great for easy listening or to crank the party up with the booming sound you'd expect from a boombox! VERSATILE INPUT + SPEAKERPHONE - 5 great functions - Switch between Wireless Bluetooth, Mini-SD/TF, FM Radio and AUX line (in & out) less than 6 seconds... or use the iFox as a speaker for that important phone call! You can easily control songs and adjust the volume at the speaker. 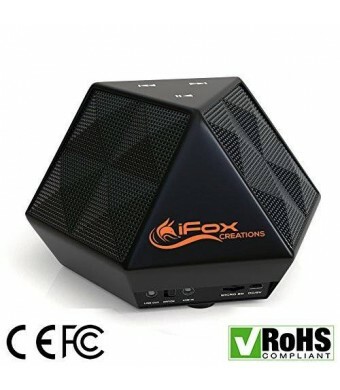 And your portable Bluetooth devices will connect to the iFox from up to 33 feet away!! SERIES LINKING CAPABILITY - You can link two or more of these speakers together to create an all-round sound. Great for a surround sound feel at low and high volumes. An Ultra-Portable speaker which you can move to the kitchen, garden, car, beach, pool, boat or campfire and get the party started wherever you go! INCREDIBLE BATTERY LIFE - No more scrambling for the charger - With a powerful 1500 mAh rechargeable battery the iFox lasts for up to 8 hours playing time between charges. Plug it into the adapter, and it's fully charged again in under 3 hours! 100% MONEY-BACK GUARANTEE FOR 1 FULL YEAR - We're so confident in our CE/FCC/ROHS Certifications we're offering a 100% money-back guarantee. You're taking on absolutely NO risk - use the iFox Bluetooth Speaker for 12 full months - if you don't like it, for whatever reason, we'll replace it or refund every penny of your purchase price! You Wireless Bluetooth streaming from all of your devices... and, of course, you can always connect your device via a 3.5mm jack. Compact Size - With a sleek design that fits in your bag or backpack! Whether you're at home, on the road, at school, on a camping trip or backyard BBQ... you'll always have your tunes! Long Battery Life and Fast Charging - iFox's 1500mAh battery allows you to enjoy up to 8 hours of music per charge. And when it's time to power up, connect the charger, and your speaker will be ready in just 2-3 hours!